Photograph courtesy Alan Baylis 25308 was briefly put to store in April 1982 then returned to service during July 1982 gaining the power unit from accident damaged 25312. This provided another fifteen months in service. In this view on July 19th 1981 25308 still has many miles to run & makes ready for departure from Shrewsbury. The seventeen year three month career of D7658/25308 was spent primarliy allocated to London Midland Region depots with a very, very brief time allocated to the Scottish Region. Built: Beyer Peacock Gorton Ltd, Works No.8068. Time between withdrawal & scrapping: 13 months. December 1970 to Birmingham Division (D02). November 1974 to Springs Branch. April 1982 to unserviceable store. May 1982 reinstated to Toton. September 1983 to unserviceable store. During April 1982 25308 was placed into unserviceable store at Derby Works and reinstated to Toton during May 1983. When finally withdrawn 25308 was stored at Crewe until moved (see details below) to Swindon Works on February 10th 1984 and broken up there by the last week of November 1984. 25097 (Bescot), 25186/25308 (Crewe), 08153 Chester – Swindon Works February 10th 1984. Noted Derby Works (?) late 1974 (dual brakes fitted). Noted Derby Works November 1976. Noted Derby Works April & May 1982 (N1 repairs). The New Year began with the continued removal of withdrawn steam locomotives from various locations. Dispatched from Colwick depot to Draper’s at Hull on January 6th were D7658 hauling 48137, 48196 & 48432 . 7658 was noted at Stewarts Lane on February 21st. 25308 & 25188 worked a roundtrip Leicester - Skegness on June 21st 1975. A Grassington - Hull Tilcon stone train was noted at Castleford behind 25284 & 25308 late on the afternoon of April 2nd. 25308 & 25316 worked a roundtrip Leicester - Skegness on June 5th with 25316. On August 21st 25308 & 25314 worked a Wellingborough - Scarborough to Nottingham, returning with the 12.01 Scarborough - Leicester forward from Nottingham. On June 4th 1977 the 08.52 Leicester - Skegness and the return 12.35 Skegness - Leicester were worked by 25308 & 25112. 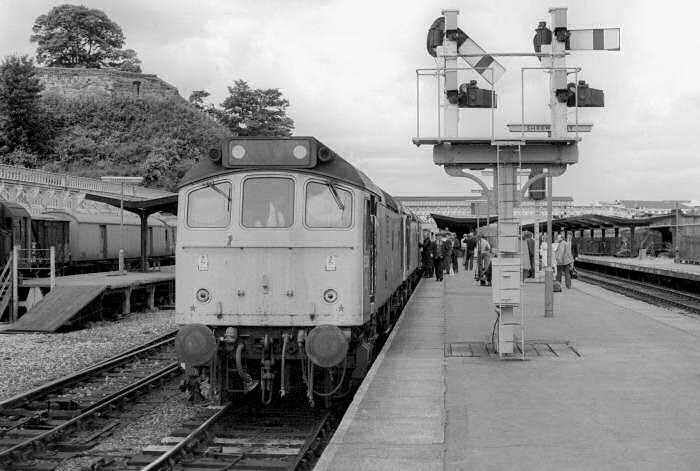 The Nottingham (ex-Derby) - Norwich - Yarmouth - Norwich - Walsall diagram on September 1st 1979 was worked by 25308 & 25269. The Derby - Nottingham leg was worked by 20188 & 20199. 25308 was receiving attention at Thornaby on March 2nd (& 22nd?). On May 16th 25308 was noted at Hereford with a train of short wheelbase tanks. The 'Severn Valley Invader' railtour on June 28th from Newcastle to Bewdley was worked roundtrip between Birmingham New Street & Bewdley by 25308 & 25305. 46025 brought the train from Newcastle. 25308 worked the lunchtime Bedworth - Lindsey empty oil tanks on August 22nd. A diesel multiple unit failure on June 19th 1981 saw 25308 assist a Wolverhampton - Wolverhampton service. A month later on July 18th the 04.10 Shrewsbury - Aberystwyth and the 10.07 Aberystwyth - Euston to Wolverhampton were worked by 25308 & 25300. The next day (19th) 25308 & 25170 worked a Taunton - Aberystwyth day excursion roundtrip betwen Wolverhampton & Aberystwyth. The following weekend more Cambrian line mileage occurred. On July 25th 1981 the 04.10 Shrewsbury - Aberystwyth and the 10.07 Aberystwyth - Euston to Wolverhampton were worked by 25308 & 25296. The next day (26th) the same pair worked the 08.45 Birmingham New Street - Aberystwyth and the 18.00 Aberystwyth - Euston to Nuneaton. The failure of 45117 at Leicester on September 2nd 1981 whilst working the 15.11 St. Pancras - Nottingham saw 25308 & 25284 complete the run to Nottingham. 25308 was noted northbound at Banbury with a lengthy train of mineral wagons on July 10th. 47363 & 25308 were noted eastbound at Wakefield Kirkgate on March 24th with a lengthy train of mineral wagons. July 20th, 25308 took 303041 from Allerton to Crewe after tyre turning, 25308 then returned with 304027 also for wheel turning, 25308 remained at Allerton to await its turn on the wheel lathe. A new freight working was introduced from August 16th, with uncoated gas pipes travelling between Leith & Heysham, again in the hands of pairs of Class 25s, so noted were 25308 & 25309 on August 16th. On September 7th 25308 was noted at Ribblehead with a loaded ballast train. 25308 was noted at Birmingham New Street on October 16th. A diesel multiple unit failure on March 10th 1983 saw the 18.50 Leicester - Derby worked by 25308 & 25296. The last recorded passengers workings for 25308 took place on August 20th 1983 and again involved a diesel multiple unit failure with 25308 working the 09.20 Crewe - Shrewsbury and the 11.50 Shrewsbury - Crewe. 25308 was withdrawn on October 16th 1983. Page added September 23rd 2013. Last updated March 17th 2019.